Many educational groups are concerned about how best to meet the particular needs of students with diverse sexual orientations and gender identities. District and school leaders plan for educational opportunities and teacher education that respond to the learning needs of all students. However, not all districts and schools have leaders and teachers with backgrounds in gifted and talented education who also know how best to address the particular needs of gifted students who are gay, lesbian, bisexual, transgender, and/or questioning (gifted LGBTQ). Due to the limited information available about gifted learners with diverse sexual orientations and gender identities, NAGC convened a task force of administrators and educators to develop tools that classroom educators can use to inform themselves and leverage as the starting point for advocacy and implementation of services for gifted LGBTQ students. NAGC believes in supporting the success of all gifted students. Factors such as race, gender, ethnicity, level of English proficiency, socioeconomic backgrounds, sexual orientation, and gender identity should not become barriers to opportunities for gifted students. The purpose of this toolbox is to supply information specific to enabling gifted LGBTQ students to participate and thrive in school. NAGC recommends that educators demonstrate understanding of these students and support them in maximizing their potential. Before these two areas of focus are addressed, there is statistical information that provide support and/or rationale for the recommendations contained in this toolbox. 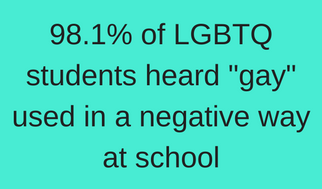 +98.1% LGBTQ students heard “gay” used in a negative way (e.g., “That’s so gay”) at school; 67.4% heard these remarks frequently or often, and 93.4% reported that they felt distressed because of this language. These statistics inform educators and parents about the experiences of LGBTQ students in school. When the element of giftedness is compounded with gender/sexual minority status, the students are, in the view of classmates, teachers, and administrators, twice other. This dual status makes these youth even more vulnerable to verbal and physical abuse at school than either giftedness or gender/sexual minority status would on its own (Manzella, 2012).